4 Doors is one of those “I don’t want to drive more than 10 minutes but I want a decent meal” type places, and it thrives on local regulars. I’ve been once before, I remember the meal. It was good but nothing overly special but I didn’t remember the interior being as it was; slightly urban and quite casual with an unexpected homely vibe. They had two steaks on the menu, an eye fillet and a porterhouse. 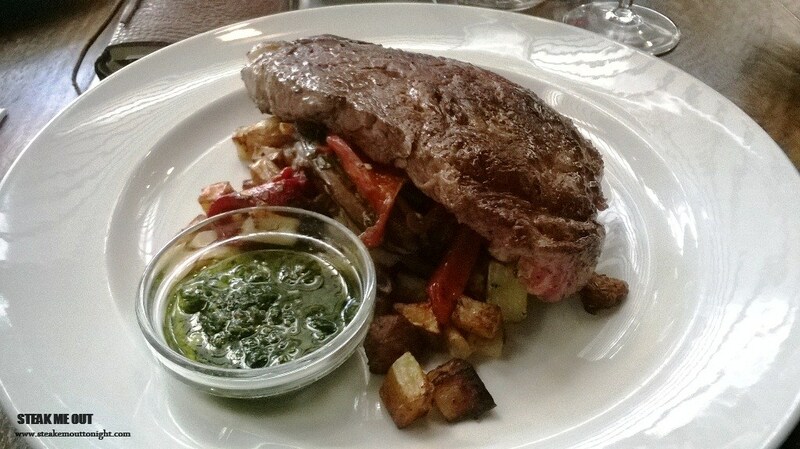 I’ve really never gotten into why I don’t order eye fillets (sometime soon I promise), so, the only option I saw was the porterhouse which was served on a bed of garlic rosemary potatoes, with warm Mediterranean char grilled vegetables with balsamic and olive oil topped with basil pesto ($32). 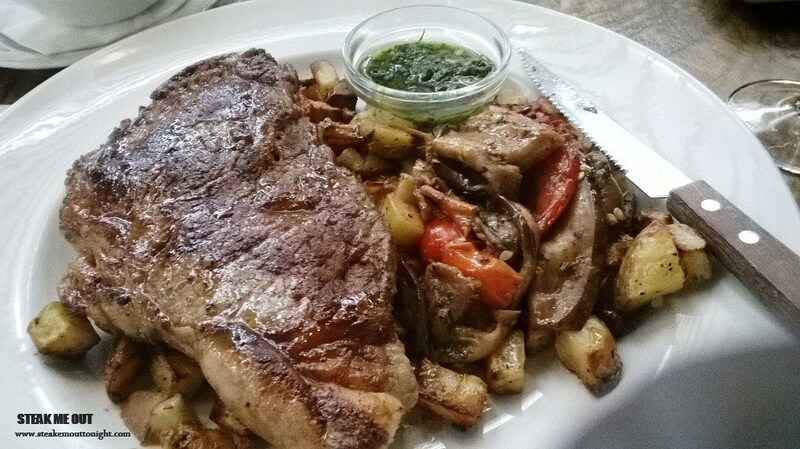 I ordered it rare with the pesto on the side. I was having dinner with a friend and she decided to get the same but ordered hers medium rare, as well as a bowl of chips to share. The food arrived rather quickly, the steaks looked okay although the vegetables and potatoes were many and slightly unappealing. 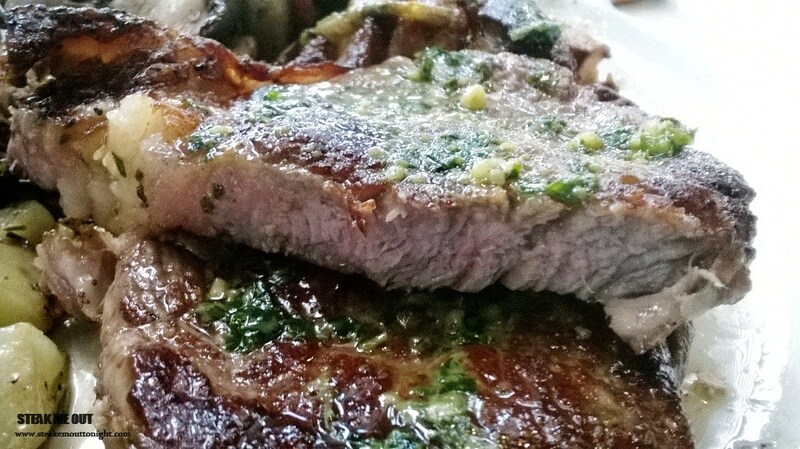 It smelled great, the pesto really vamped up the aromas and salt of the steak but there was a lack of pepper with no shaker in sight. Cutting into the steak we were both equally disappointed. Mine (first picture) was cooked to a medium, hers well done. I was not expecting too much from 4 Doors and they delivered on my expectations. I think with a bit of fine tuning, a change of sides and proper cooking they could have a good steak on their hand. 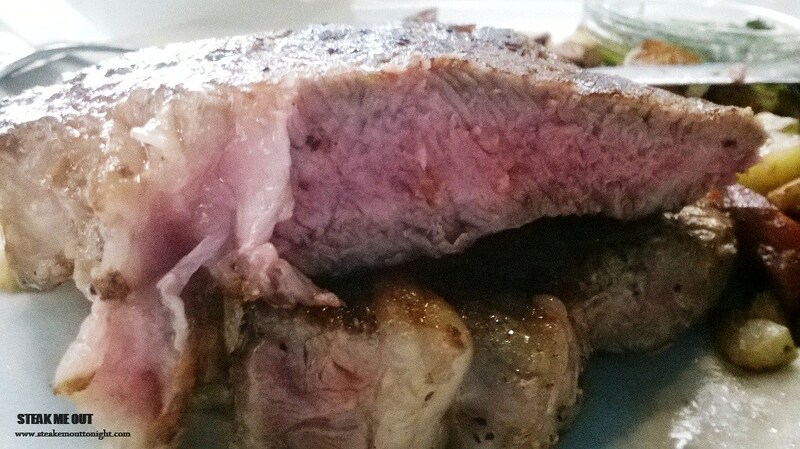 Posted on January 20, 2014 October 13, 2015 by AdrielPosted in Melbourne, MISteaksTagged Melbourne, Porterhouse, Steaks.